Beekeepers know if they stay calm the bees might, too. “Well there’s a lot of bees this year,” said the Austin Bee Czar, Walter Schumacher. 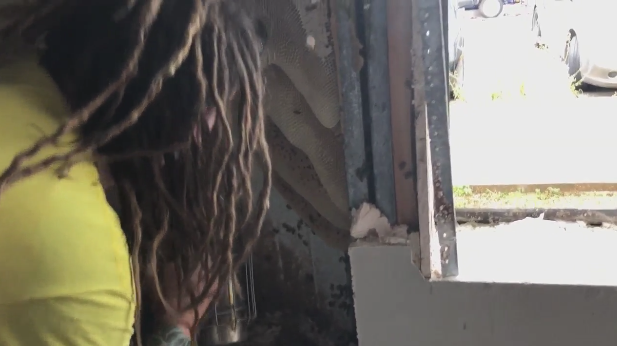 On Tuesday it was business as usual as he removed a hive from inside the wall of an Austin factory. “A bee removal, a relocation, is something that I do almost two a day of,” said Schumacher. Schumacher runs the American Honey Bee Protection Agency. Years of experience has taught him to know the warning signs of a bee attack. “The first thing that a honey bee does is it bumps into you. Before stinging you it runs into you to warn you off,” said Schumacher. That’s your signal to leave the area. “You don’t want to run or wave your arms because bees target motion,” said Schumacher. His best advice is to quickly walk away from the bees. “If you stand and fight they’ll win. So you want to get away,” said Schumacher. Ideally, you can get inside a house or car. If not, keep moving. “The majority of bees will stop chasing you at 100 meters,” said Schumacher. Even if you’re only stung by a single bee leave the area. When bees sting they leave a pheromone or chemical message telling other bees you’re dangerous and should be attacked. Schumacher’s last tip is to shield your face and eyes when you’re making your escape. The bees that attacked the Austin woman and her dog were Africanized bees. They are more aggressive than the honey bees that are normally found in Texas.